Knowing the most advance in technology is one of the best thing we ought to do to ourselves. Technology is not only might for a specific people but the learned ones has made it more effective to our business environment like banking and more that has to do with science and Technology. Previously, Techbmc updated a post which has shown all the basis on how to block unwanted calls from several network like MTN, GLO, AIRTEL, 9mobile etc. and lot more. Today, we will be looking into the newly welcome app (SWIFT) and its features having some crucial aspects you and I should know about. 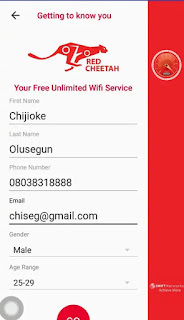 A new interesting app (SWIFT Red Cheetah) has find it way to some region and following the related features of this app, it's a free Wifi App that allows you to connect online although is a 4G network from SWIFT that sits in some of the states in Nigeria while some states are yet to experience this SWIFT free Wifi Network. Actually, not everybody has acknowledged or have that impacted idea on Red Cheetah Free WiFi. 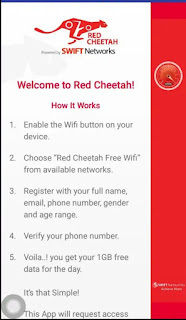 If you are still wondering what's this or how can you use this or benefit from it, after reading this post you should be convinced about what Red Cheetah Free WiFi is all about. Someone already leaped interesting question, asking, is the SWIFT Red Cheetah Free WiFi App downloadable on google play store. Well, that's a good question and the answer is yes. Note, if you have downloaded this app or one of those guys who's job is to educate people on how to use this app and the enjoyable features, by now you should be conversant with the app but if No, below is more information about the Android apk application. It will only favour those in Lagos as for Now. 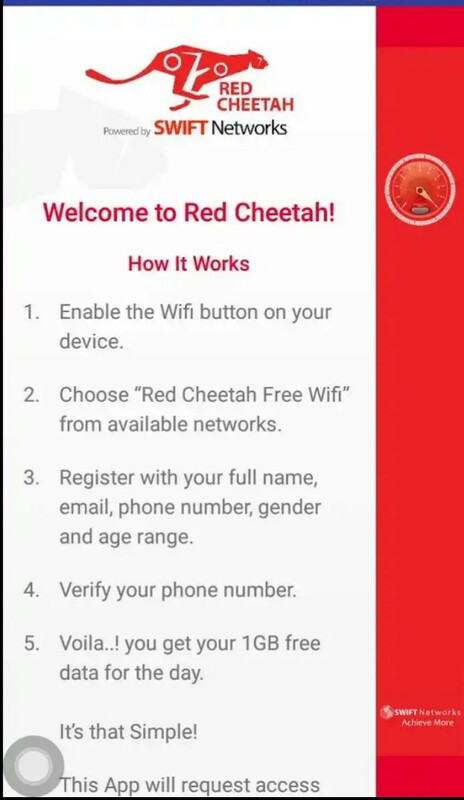 With the SWIFT Red Cheetah Free WiFi App you are not limited to the WiFi after getting the app. The App is a freeware on Google Play store just for you to download it. Note Also: The aim of this Network has been Unveiled and co-partnership has told the main subject that will substantial their free hotpot brand. 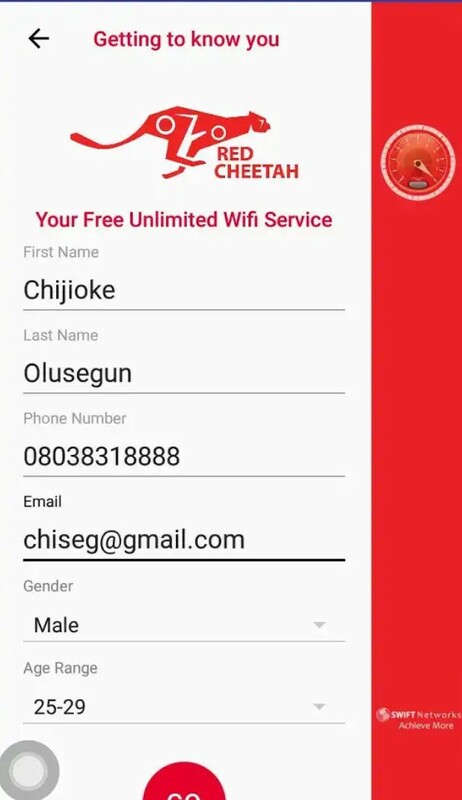 One of the chief executives has spoken about the need of this SWIFT Red Cheetah and has also said that Lagos will be the largest WiFi Footprint and only in the area but Africa as a whole. He also pointed the areas which someone can easily reach this service, places like School environment,inside taxis, in the shopping malls, bars,restaurants and some of the public environments. Looks very interesting but one or more of this you should know is that the app is free and free hot but many seem worried about the app base on the pop up ads while browsing. Although that's awful but the pop up ads can only take some few seconds. Please you need to allow the ads to play or the WiFi will disconnect itself. If you are seriously in touch with this App, you can easily navigate to the recommended areas like restaurants and Buses. So you can get started by downloading the app on Google Play store and follow the screen instruction like inputting your information as you register. process you also verify your number by receiving a message with the number you use in registering with the app. Now select the Go Button to get access on SWIFT Red Cheetah Free WiFi App and start the journey of free browsing or surfing the internet. this you can set the data cap to above 1GB to any cap of your choice although setting cap is optional but we do this just to maximize the data cap. With this free Wi-Fi browsing, you can download videos, watch and stream live videos online (YouTube), download games and apps, read latest news online, download your documents in PDF format and many other things one does online with internet enabled phones. Help others to get this good information by sharing on social medias with the below following social buttons. This post is authored by Links and he blogs professionally on an Entertainment and Celebrity site called www.thetopstars.com ...Ensure to visit for latest gist in the world of celebrities.